According to the TTC’s diversion notice, normal service will resume on Ossington between College and Dundas on Monday, October 28. 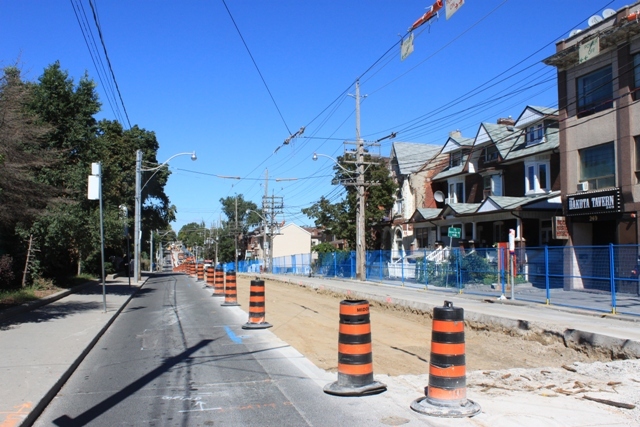 Construction of new track has proceeded north on Ossington from Dundas and is in various stages of completion. Excavation of the roadbed at the north end is in progress between Shannon and just south of College (behind me in the photo below), the limit of the work. 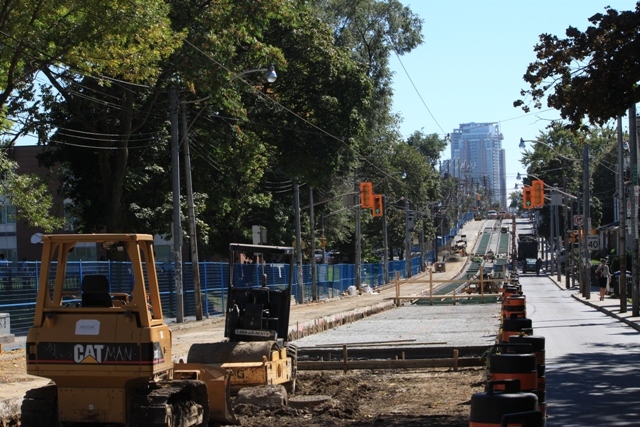 The track on Ossington Avenue between Dundas and College is one of two remnants of the Dovercourt car, a busy streetcar line that served the industrial area near King and Strachan. Work began at Dundas and is in various stages north to College. 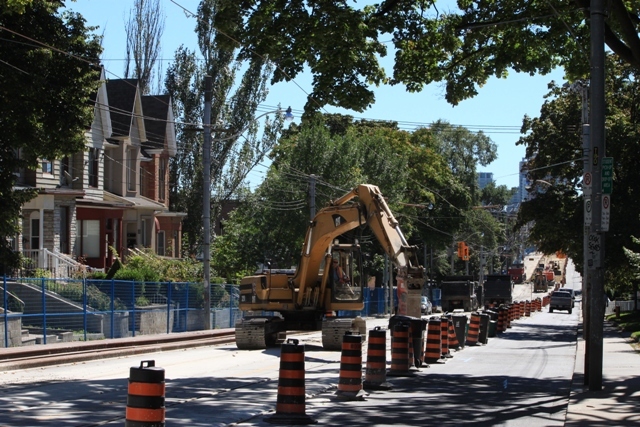 63 Ossington buses divert around the work site via Dufferin Street. Just north of Dundas, the street is ready to receive the foundation slab. Looking south at Ossington & Shannon: Demolition of the old concreete is in progress, and strings of new rail lie in wait against the east curb. ← How Does The City Grow? I’ve always found the track on Ossington interesting as it is only useful for diversions to the 505 Dundas Car between Ossington and Lansdowne or the 506 between Ossington and Bathurst; it doesn’t allow 506 College cars to get around an obstruction such as at Dufferin Street. Not removing the track between Queen and Dundas would have provided more emergency and diversion routes, even carhouse movements to Roncesvalles (useful if that street was obstructed). The Ossington and College intersection is the same as it was when the Dovercourt Car ran until 1947 (Dovercourt Cars here jogged on College to go northbound on Dovercourt), though I believe a south-to-east connection was added at Dundas when the track south of there was removed. I’m a bit surprised that the TTC never added the missing WB College to SB Ossington and EB Dundas to NB Ossington (and their corresponding opposites, of course) when it was decided to retain that section of track. Steve: The south to west at Dundas and Ossington would be a very tight curve because of the intersection geometry. I concur with the connection to Queen. It would help a bit. Google maps suggests and eastbound Dundas to southbound Ossington might work. Of course, if Queen and Bathurst was a grand intersection – then cars could go down Ossington and then back up Bathurst. Basically, I am of the opinion that as streetcars are on a fixed line, the more possible re-routing option there are will always help in the event of an interruption in the line ahead. Steve: Adding track on Ossington below Dundas is highly unlikely given the cost, disruption and relative infrequency of use. Also, Queen & Bathurst is a fairly young intersection (it has already been rebuilt to new standards) and the next opportunity to add curves will not come for a few decades. In the meantime, the TTC should concentrate on intersections coming due for reconstruction in the short to medium term for potential additional curves. The other, I assume, is the track on Shaw. I wish they would, but obviously based on Queen and Bathurst, they will not do so. On one hand, I concur that there is not always frequent need for extra turns, but as streetcars do not have the ability to turn on any street like a bus, any opportunity to add turns/diversions should be looked into. Off topic of Ossington’s reconstruction slightly, but with turns brought up – why is it that a lack of non-revenue track exists outside of the core? Yes, I understand non-revenue means no money for investment, and there are other more important kinks across the system to be worked out… but when you’re out in the far ends of some lines, one mistake can cripple service. I think of the massive off-track diversion between Broadview and Coxwell if there’s an issue; something like track added down Carlaw or Greenwood or anywhere really would be beneficial to keeping cars moving, no? I know drawing lines on maps is silly, but there must be some place in the city that added tracks would help out. Steve: The “non revenue” track is all leftovers of former streetcar lines. None of it was purpose-built for diversions. Yes, it could be argued that some additional diversion tracks could be helpful, but given (a) the current attitude toward streetcars and (b) constraints on the capital budget, I would rather see the money spent continuing the upgrades of the infrastructure we have already. That said, there are cases, notably with Adelaide and York Streets, where the TTC dropped the ball on an addition to possible downtown diversion track. I have still not been able to get a straight answer out of them, and suspect that nobody really knows. Adding this new track make for sense then rebuilding Richmond and Adelaide. It would be shorter, cheaper and more useful. Steve: Aside from your fractured syntax, I don’t agree. Both Richmond and Adelaide are useful for short diversions and turnbacks. The fact that Adelaide has been allowed to wither thanks to construction over the years shows how attentive the TTC is to flexibility in its network. I find it remarkable how swift the work can be completed in the case of Ossington. It’s a lot of work.. If one found themselves in a city unfamiliar to streetcars like Vancouver, for instance, the construction would likely take three times longer at an equivalently multiplied cost. If only the City Of Toronto could get their infrastructure coordination together, we’d have Spadina/QQ, done by now ..I’m sure the TTC has been chomping at the bit to get that one done for a while. Any word on that, Steve? Steve: I believe the trackwork on QQ is to begin sometime in October. The problem has been that Hydro is running late with all of its work both because of a late start and because of problems in some locations with the high water table. Because the overall utility work progressed from east to west, the last area to be freed up is the Spadina and Queens Quay intersection. Work underway now is focused on the electrical feeder and support system including splicing chambers (underground boxes where the electrical feeds are tapped for connections to the rails and overhead) and pole bases for lighting and span wire support. You can follow the detailed progress of work at Waterfront Toronto’s Constructing Queens Quay page.